The most interesting themes for a Toastmasters meeting are often topical, especially if they take a sideways look at what is going on. Andrew Miller chose the Commonwealth as his theme for the meeting on Monday July 28th and gave a fascinating insight into the origin of the word and how the Toastmasters ethos of working for our mutual good and wellbeing and the good of the organisation is comparable. Grammarian Bridget Pearson (our newest member who is stretching herself at every meeting!) chose UNITE as her word of the day –both in its meaning related to the Commonwealth theme, but also as a noun meaning an old English coin worth 20 shillings which was then equal to one pound. Some members had great fun with this use of the word! Richard Bluck took on the challenge to research a topic and speak about it by demonstrating the Triz problem-solving, analysis and forecasting tool derived from the study of patterns of invention in the global patent literature, which was created by Genrich Atlshuller in the late 1940s. Richard managed to explain this complicated idea very clearly – and I for one have already gone online to read more! Derek Badger is working on one of the 15 Advanced Manuals, called Technical Presentations, and his first speech was a Technical Briefing which he chose to make a session about preventing Fire in the workplace. Helped by a stack of visual aids he expertly lead us through the “triangle” of fuel, oxygen and heat that is needed for a fire to take place, and emphasised his points with poignant personal anecdotes. The new Area 15 Governor Chris Worfolk was warmly welcomed to the meeting and gave us a very informative talk about leadership – applicable to both Toastmasters and the workplace. He identified the five areas against which a potential leader should measure him or herself, and then gave a diagram on which to evaluate ourselves and, as time goes by, measure our progress. And finally – be the Manager. After the break Jean Stewart ran a lively and very enjoyable Table Topics session in which we were invited to choose one of a series of objects from her home. Gail Powell’s tale about why not to buy people a mug and Bridget Pearson’s sad story of what happened to her cuddly toys were joint Winners. The evening ended with the evaluations, showing contributors to the evening where they performed particularly well and where they could improve. Alison Kitchman was Ah Counter and she decided to challenge herself by not simply pointing out crutch words but also offering ways to reduce their use. She started off by saying that Filler words are not written into a speech. She then explained how using crutch words weakens our credibility and authenticity. Embrace the pause. Give yourself time to think. She then gave detailed feedback to participants. This resulted in her going way over her allotted time (and she had more to offer if people wanted to talk to her afterwards) and therefore could not be included in vote for Best Evaluator. In the Q and A session at the end of the meeting Alison made an impassioned plea for the same amount of time to be allocated to the Ah counter as to the Grammarian. After a lively discussion it was decided to do this in future meetings. 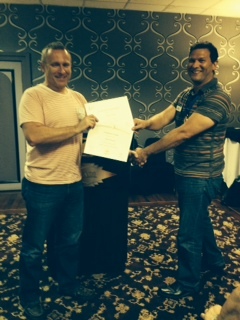 At the end of the meeting, Andrew resumed his role as Club President and awarded Mark Powell with his certificates and pins for achieving the two Awards Competent Communicator and Competent Leader. He also awarded the Best Evaluator to Derek Lucian, Best Table Topics to Gail Powell and Bridget Pearson and Best Speaker to Richard Bluck. This meeting was held, unusually, in the Earl of Doncaster Hotel. All future meetings will revert to the Regent Hotel in Doncaster. The next two meetings are on Monday August 11th and Monday August 18th, and the Club Speech competitions will be held on Monday September 8th. All meetings start at 7pm. Posted on 3 August 2014, in Meeting Reports, News and tagged Commonwealth, doncaster speakers, GE report, general evaluator's report, Mark Powell, meeting report, Public speaking Doncaster, Shelagh Jones, Unite. Bookmark the permalink. Comments Off on Doncaster Speakers Meeting Report | Monday 28th July 2014.